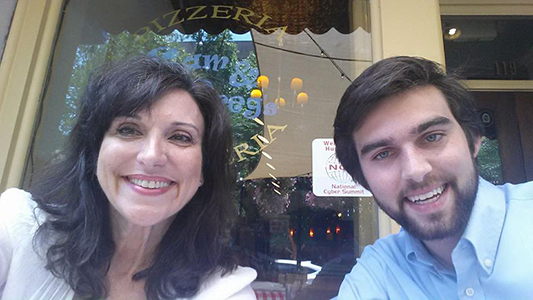 Beverly Massa with her son, Patrick Fitzgerald. For juniors and seniors one of the most popular people on campus is Co-Op coordinator Beverly Massa. Besides being in charge of early release for students signed up for the program, Massa assists students in applying for jobs and internships to help further them outside of just their academic opportunities. As a former business teacher, she uses her business connections to find openings in businesses near by and gives an extra boost for students to reach their full career-based potential. Massa, a former Co-Op student during her own high school years, obtained a job working at her local courthouse. She said she was able to create and grow connections with others throughout that field of work. Having that job jump started her first career at a law firm that led to thoughts of going to law school. In the end she received a business degree partnered with business education which resulted in her current position of Co-Op coordinator. “When I was in high school I was actually enrolled in my school’s Co-Op program because I knew I was going to have to find my own way to fund my college from being in a middle class large family,” Massa said. Although students see Massa as the gateway to finding a job, there is so much more to her. A simple sit down would reveal Massa’s entrepreneurial spirit, which make her the ideal candidate to discuss future plans. Being second generation in this country, and growing up in a predominately Italian coal mining town, Massa did not have the same childhood as most children, especially with eight brothers and sisters. She and her husband, Tom Fitzgerald, are both from St. Louis. Both of their fathers had been a part of the same fishing group, the Dover Boys, which was the initial connection between their families. They first met in Collinsville at a large Italian festival, in which Massa competed in a grape-stomping competition, when one of the competitors was unable to compete. With Fitzgerald’s retirement quickly approaching, Massa and her husband plan to open their own distillery. Currently they own a few acres of land where they started a vineyard, both Fitzgerald’s and Massa’s families have been in the wine-making business for centuries. After Tom’s retirement they plan to open and run their vineyard, winery and venue.